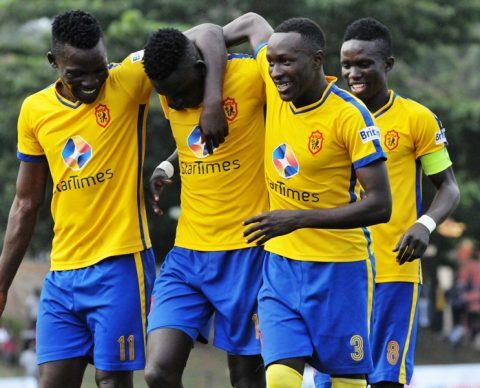 LUGOGO – Patrick Kaddu finally got his season started, scoring a hat trick as KCCA FC defeated Paidah Black Angels 3-0 in the StarTimes Uganda Premier League. Kaddu who came into the game with only three goals this season, was at his lethal best, scoring all three in the first 45 minutes and in process becoming the first player to score a treble this season. After a nervy start, Paidah looked on as their worst nightmare of conceding early, unfolded in the 15th minute with Kaddu headed in Mustapha Kizza’s cross from the left. One would soon become two with the former Maroons striker finishing neatly past Paidah goalie-John Kalumba after Allan Okello’s fierce drive was charged down. On 33 minutes, Paidah were forced into an early substitution when Muhammad Kasirye was forced off with what looked like a fever, and replaced with Charlie Anjubuku. With two minutes of the first half to play, Kaddu completed his hat trick, finishing from close range and after Jerry Adebu cleared the ball before it reached the net, assistant referee Gilbert Nyendo signaled that it had crossed the line initially. At the sound of the halftime whistle, Paidah looked like a side whose will had been broken. Two minutes into the second half, the home side made their first substitution with Steven Sserwadda replacing Herbert Achai. KCCA could have added onto their tally in the second half but Kaddu and Okello could not get past the Paidah back line which looked more organised and determined in the last 45 minutes. Later on in the game, KCCA FC Manager, Mike Mutebi made a double substitution, sending on Allan Kyambadde and Gift Ali. For his magnificent performance, Kaddu earned himself the man of the match accolade that comes with Shs.100,000. The win on Tuesday is KCCA’s 8th of the season and they now move onto 27 points, 4 ahead of Onduparaka who are in second. For Paidah, they remain rooted at the bottom of the pile having gathered only 4 points from their first 12 games. Action in the StarTimes Uganda Premier League resumes on Wednesday with defending champions Vipers SC away to Bul FC at Njeru Technical Center in Jinja.